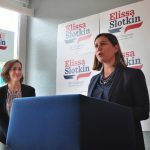 ELISSA SLOTKIN is among the most well-qualified newcomers running in any congressional contest this year, and we recommend her enthusiastically to Democratic primary voters in Michigan’s Eighth Congressional District. An Oakland County native of Holly whose grandfather founded the Livonia-based company that gave America Ball Park Franks, the 42-year-old Slotkinenlisted in the CIA after the 9/11 attacks. She served three tours of duty as an intelligence officer in Iraq, where she met her husband, a U.S. Army colonel. 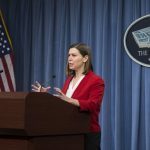 After returning to Washington, she served in the National Security Council under then-president George Bush, then became acting Assistant Secretary of Defense for National Security Affairs under Bush’s successor, Barack Obama. Slotkin’s expertise in foreign policy and national security is deep, but she says she was moved to run for office when her district’s incumbent congressman, Republican Mike Bishop, voted to repeal Obamacare without proposing an alternative for covering the hundreds of thousands of Michiganders who obtained health coverage under the Affordable Care Act. Brilliant, energetic, and focused like a laser on the concerns of her sprawling district, she has outraised her incumbent Republican opponent as well as Chris Smith, an MSU professor who is Slotkin’s lone, under-funded challenger for the Democratic nomination.